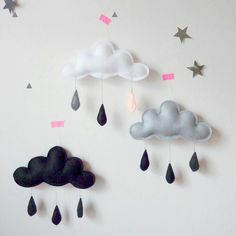 This has to be one of the cutest mobile ideas I have ever seen for a baby nursery. I first discovered these while browsing Etsy. Here’s the link to what’s currently available Etsy – Mobile Clouds. Making these seems to be pretty straight forward but I always like to have instructions on hand in case I get stuck. So, I did some digging and found the tutorial linked below – it’s great!